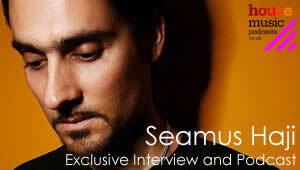 The team at House Music Podcasts were lucky enough to speak to the one and only Seamus Haji and asked him a few questions about his Dj Career! and what he has lined up over the next 12months. I was fascinated by the art of mixing & scratching in the early 80′s and by the mid eighties I had taught myself how to do it for my own pleasure really. I got into DJ’ing in public purely by being in the right place at the right time. The first pop record I bought was The Police “Roxanne” and the first dance record was Africa Bambaataa & The Soul Sonic Force “Planet Rock”. DJ’ing in some new destinations such as Brazil, Argentina, Siberia, Egypt and Morocco. I also compiled and mixed a compilation for Men’s Health magazine and more recently Bacardi/MOS in Germany for which I’ll be touring for out there. We are also just putting together our next Big Love Compilation on the label. Remix-wise I’ve done remixes for Mariah Carey, Carolina Liar, The Dream feat Kanye West, One Eskimo, Simply Red and Sneaky Sound System. I just finished a remix for Mimo “Will You Be There” on Mute and a Vocal mix for Huggy & Dean Newton feat Sam Obernik “Get Lifted (Indian Summer)” on Big Love. Production-wise we released my single with Paul Emanuel feat Roachford “In The Moment” earlier this year and my other collaboration with Romain Curtis feat Awa “I’ve Been Looking” more recently. When I was 16 I was at a party with some friends and the DJ’s in the sound system that were providing the music & equipment couldn’t mix so my mates convinced them to let me show them how it was done. This was in the mid 80′s when most DJ’s didn’t mix in time and the records had various tempos & some had live drums so it wasn’t as easy as mixing house music today. Anyway, they were suitably pleased by me and asked me to join their crew. Probably my first big gig which was an all dayer in South London in front of about 2000 people. I was 16 and I remember my hands were shaking before I started and that’s the first and last time it ever happened. Luckily I managed to overcome my nerves and everyone was impressed. 7 hours at Utopia Club in Warsaw. I have 3 Technic SL1200 turntables and a Vestax PCM46 Rotary mixer which was all I used to use before I started to use CDs instead of vinyl. Once Pioneer started to sponsor me as an ambassador for Pioneer I acquired a CDJ1000 MK1, CDK1000 MK2, CDJ800 MK1, Pioneer DJM-800 mixer and Pioneer EFX 500 FX unit. Get into production. Do a course and learn how to make your own music. It will help you establish your sound and your profile. And do what you feel and believe in. 6000 people at Arena in Belgrade. My remake of “Last Night A DJ Saved My Life” which reached number 13 in the UK National charts. Pioneer got me into playing CDs because of the fantastic design of their CDJ players. When I saw the tricks that original ambassador for Pioneer, Roger Sanchez was doing I knew I had to make the change. I love vinyl and I have about 20,000 records which date back to Soul, Funk, Jazz, Disco, Electro, Hip Hop and early house but technology has taken over and you have to move with times. I’m still not playing off a laptop though. I don’t like the way it looks in a club! I produced a single with Kaskade feat Hayley “So Far Away” just signed to Ultra in America and I’ve also just done a collaboration with Mark Knight & Funkagenda on a full vocal version of their Beatport number 1 “Good Times” for Toolroom. Aside from that I have also written and produced music for some of UEFA’s TV campaigns along with Paul Emanuel. We are currently working on the RESPECT and Women’s EURO campaigns. It’s great to have new challenges! I’m also currently working on a new male vocal track and there is also a follow up single with Romain Curtis & Awa in the pipeline. I think it’s a bit fragmented with some people only liking minimal or tech or Electro or progressive or whatever…to me it’s all just house music and I just play what I like and mix it up. I think that there’s a new wave of house coming through that’s been inspired by the Swedish boys and so there’s a lot of tribal edged beats going around now but not that many vocal tracks. There’s also an overkill of familiar rinsed out records from 10 years ago doing the rounds again but I guess it’s new to the younger generation. We need some more good songs! I’d like to do a mini Australasia tour but as I have a wife and 2 young kids I don’t like to be away from them for too long and the thought of bringing them with me all that way is too stressful…2 boys hyperactive aged 8 and 6 on a 24 hour journey to Australia is my idea of hell! Spend time with my family, run along Brighton seafront with our dog, swim, go walking and catch up with friends over some nice food and the odd drink.